Gur-e Amir Mausoleum (‘emir’s tomb’; also spelled Gur-Emir; Uzbek: Go’ri Amir), a masterpiece of medieval Central Asian architecture, is the sepulcher of Tamerlane (Timur), his two sons Shahrukh and Miran Shah, his grandsons Muhammad Sultan and Ulugbek, and Tamerlane’s spiritual mentor Sayyid Baraka. 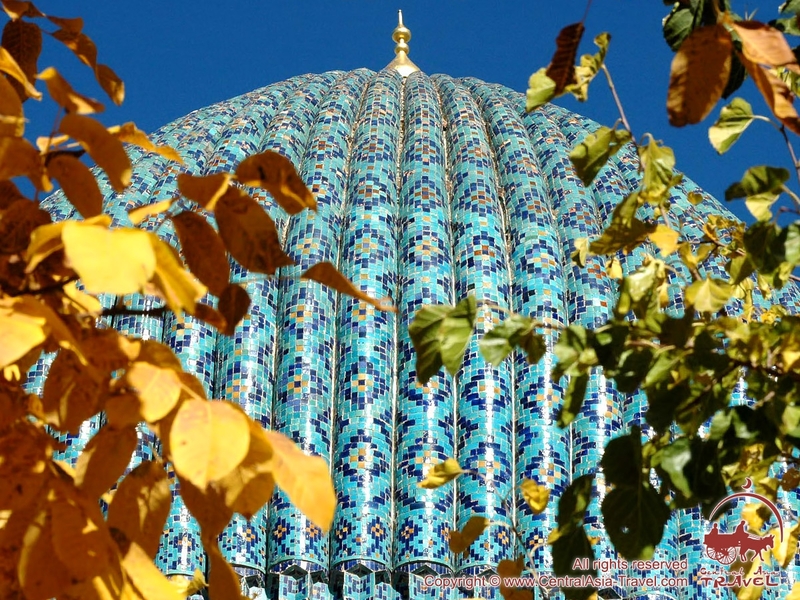 The mausoleum was originally designed as the sepulcher of Muhammad Sultan, Tamerlane’s favorite grandson and the heir to the throne, who was killed during a military campaign at the age of 27. 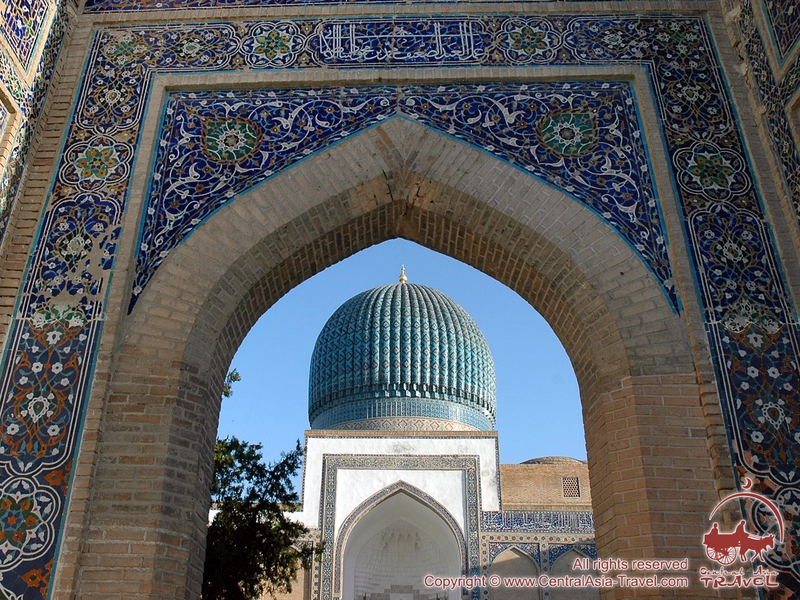 The construction of the mausoleum began in 1403, by order of Tamerlane, in the grounds of an architectural complex that had been built by order of Muhammad Sultan in the southeast of Samarkand in the 14th - 15th centuries. 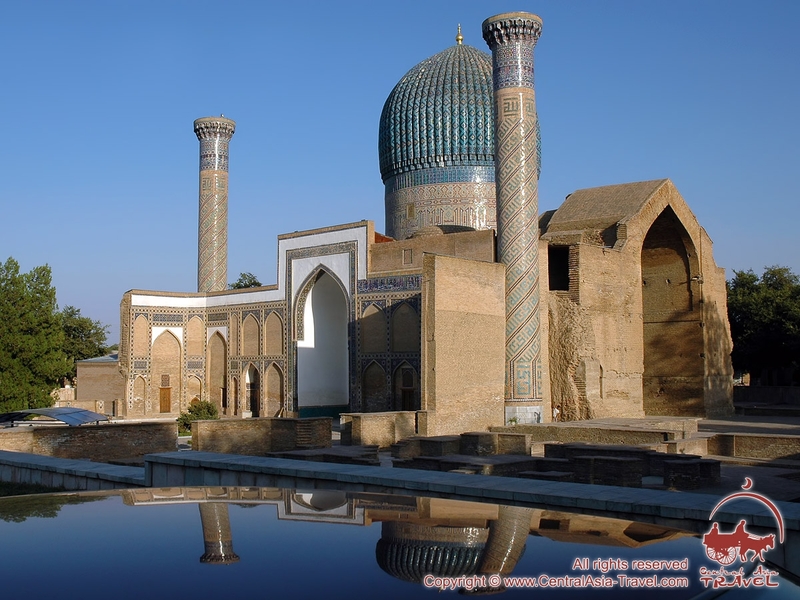 The complex comprised a madrasah and a khanaka, both facing the rectangular courtyard, as well as four minarets at the courtyard corners and an entrance portal. The khanaka was also the prince’s residence. Only the foundations of the two buildings of the complex, its entrance portal and two of the four minarets survive. 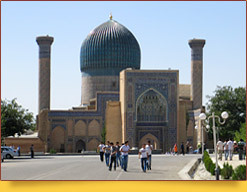 Initially, its purpose was to be a center of Islamic education, which the construction of the mausoleum made different. In 1405, during his military campaign in China, Tamerlane got ill and died. 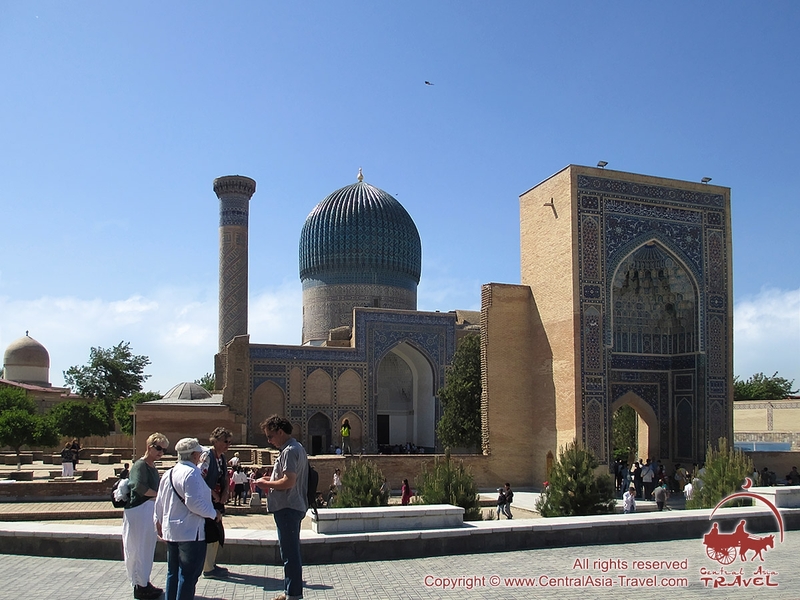 Although there was a magnificent mausoleum built for him earlier in his hometown Shakhrisabz, he was buried next to his grandson in Samarkand mausoleum, which was named Gur-e Amir then and became a family sepulcher of the Timurids. 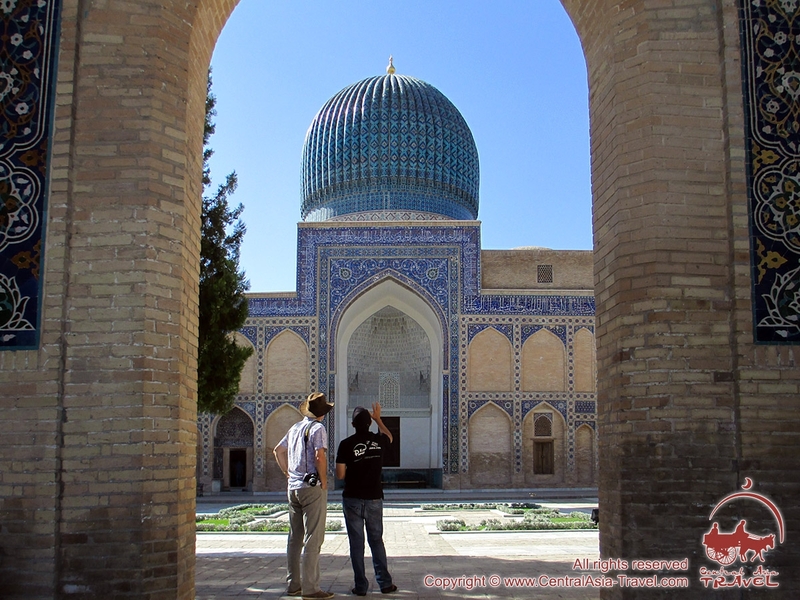 The mausoleum was modified during the reign of Ulugbek, another Tamerlane’s grandson, ‘a scientist on the throne’ whose discoveries greatly advanced knowledge in the field of astronomy and mathematics in the Middle Ages. Ulugbek was buried in Gur-e Amir, too. 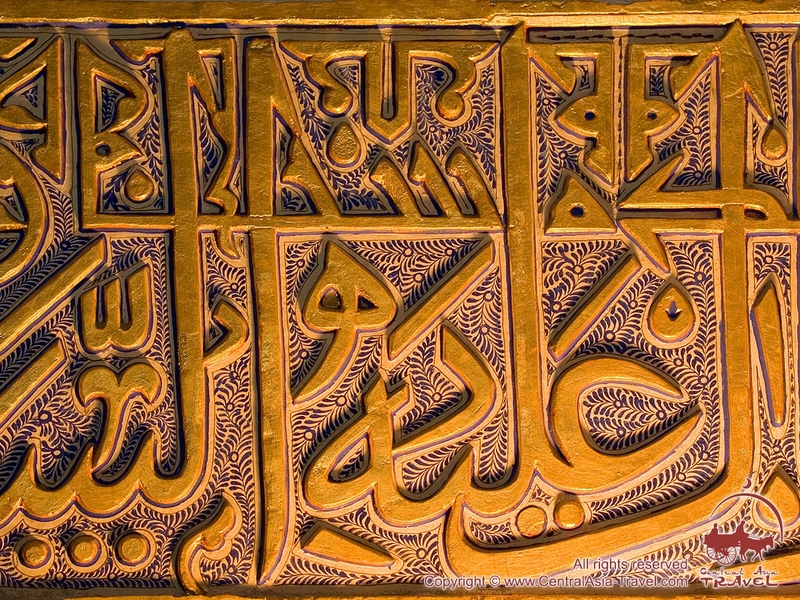 His tombstone bears an inscription saying he was killed by his son Abdulatif. The one-dome octagonal building of the mausoleum is a perfect example of Central Asian architecture of Timurid times, a precursor of Humayun Tomb in Delhi and Taj Mahal in Agra. 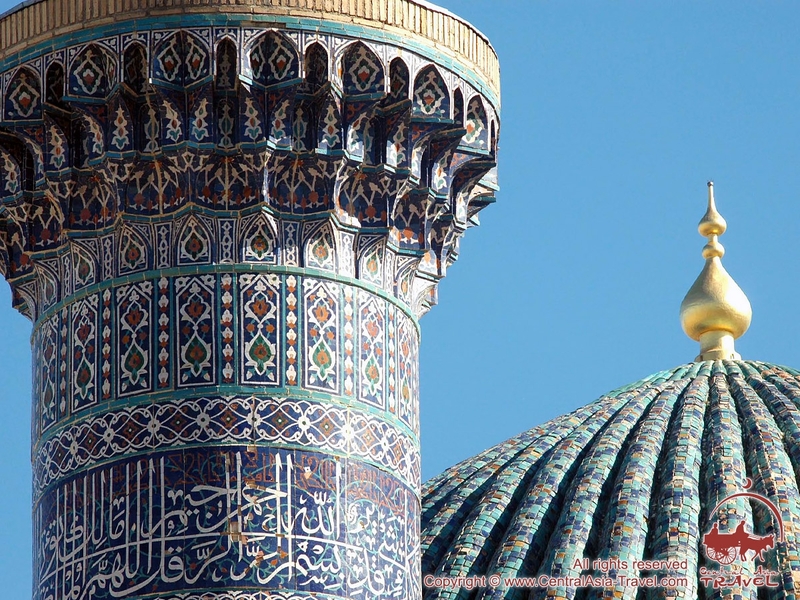 Its grand light blue onion dome features 64 ribs equaling the number of years the Prophet Muhammad lived. 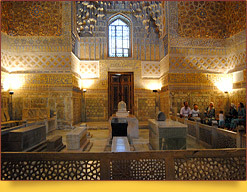 The grand chamber of the mausoleum features large niches designed to make it look even larger. The lower part of the walls, their dado, is covered with onyx slabs, and, higher, with decorative bands and splendid star patterned murals. 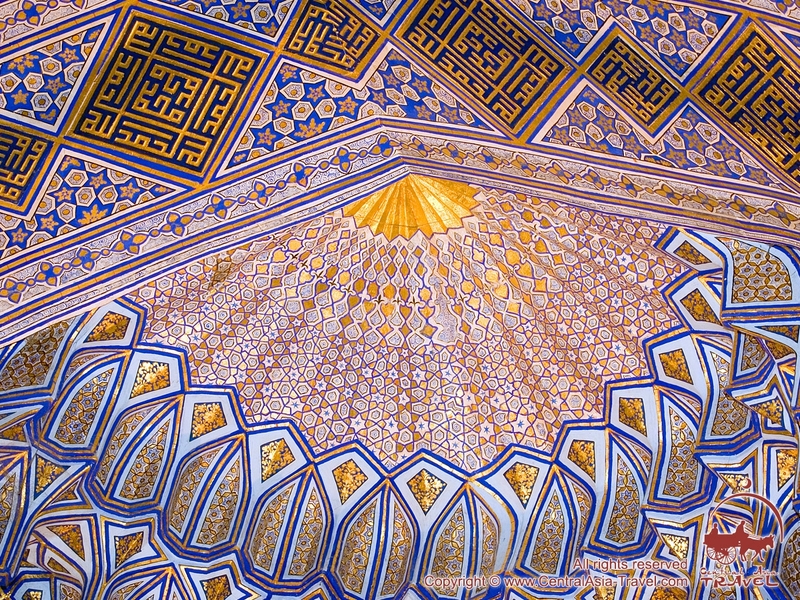 The inside of the dome and the squinch arch feature beautiful relief papier mache muqarnas, gilded and covered with beautiful floral designs. 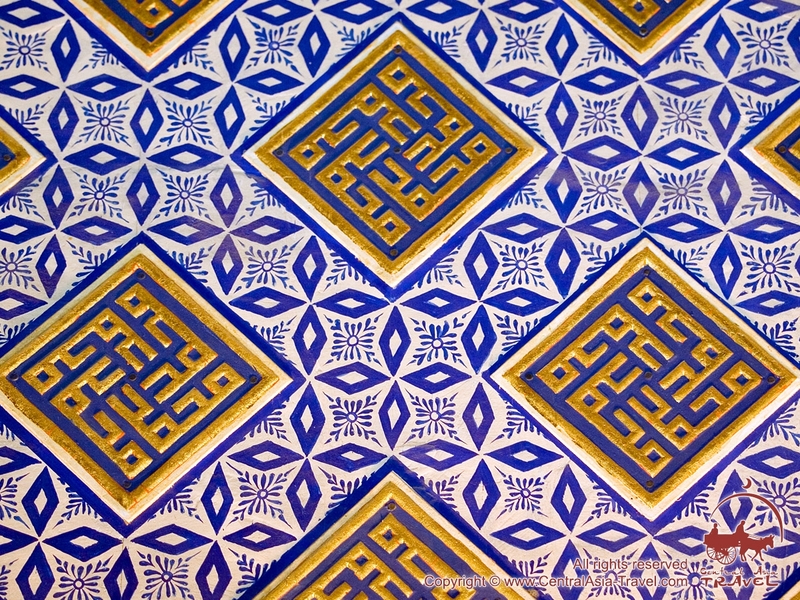 (Muqarnas, also known as mocárabe, honeycomb work, or stalactite work, is a type of corbel employed as a decorative device in traditional Islamic and Persian architecture, reminiscent of stalactites, taking the form of small pointed niches, stacked in tiers projecting beyond lower ones). The wooden entry door is also quite noteworthy. 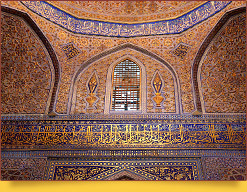 It was installed during the reign of Ulugbek and is decorated with very fine carvings. The tombstones in the main chamber of the mausoleum mark the actual graves in the underground crypt of it. 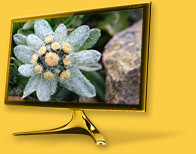 Tamerlane’s tombstone, brought by Ulugbek from Moghulistan (or Mughalistan) in the 15th century, is the world’s largest piece of nephrite (jade), dark green. Earlier the stone, believed to possess magical powers, had been an object of worship in a Chinese palace, and then was used as a throne by a Chagatai khan, a descendant of Genghis Khan. 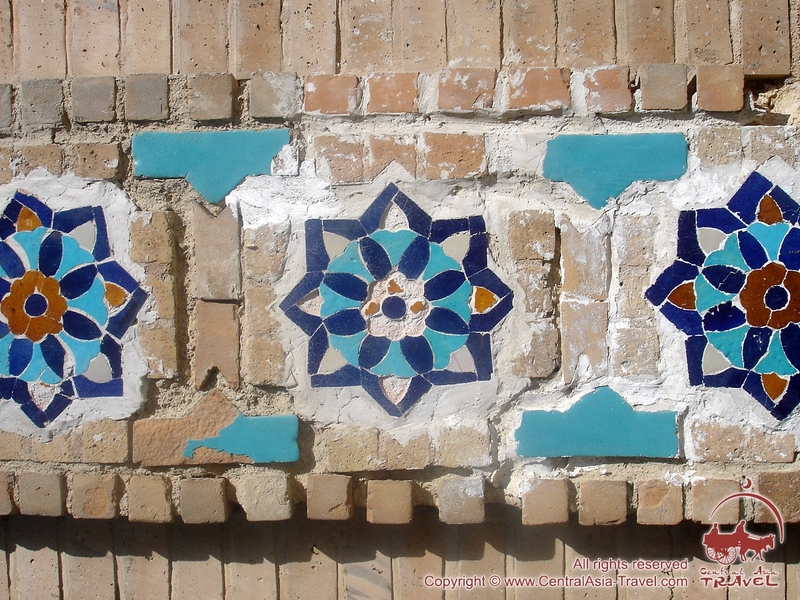 The stone is broken in half - a consequence, according to legend, of appropriating it by Persian king Nadir Shah who invaded Samarkand in the 17th century and removed it. 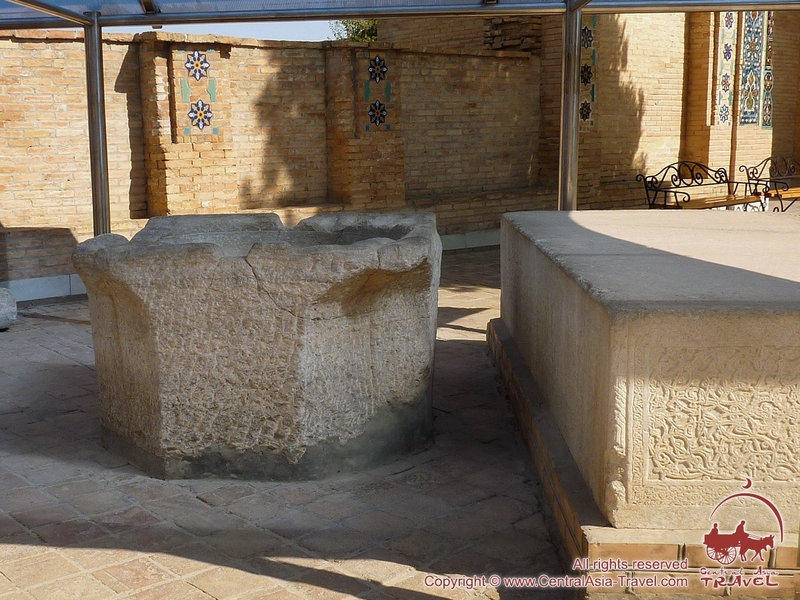 Nadir Shah placed the stone before his throne to serve as a step - or planned to use it for decoration - but soon he was struck by ill luck, and, as his advisers strongly recommended, ordered that it was put in its place, and on the way back to Samarkand it was broken during an accident. The Soviet anthropologist Mikhail Gerasimov used the exhumed sculls of Tamerlane, his sons and Ulugbek to reconstruct their faces. They could also confirm the authenticity of all the bodies in the mausoleum, Tamerlane’s height (172 centimeters) and lameness, and the fact that Ulugbek was assassinated. 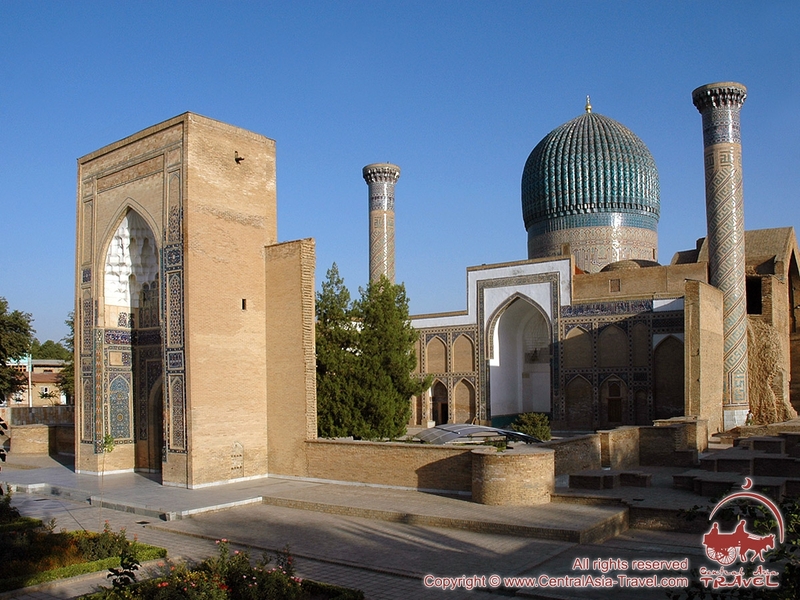 The large stone in the courtyard of the mausoleum is notable for the fact that it was used by the Timurids for their coronations.